Earlier on Saturday, Chaudhry and NAB had traded barbs once again after the former ordered an inquiry into the minister’s tweet regarding PTI leader Aleem Khan’s case. Foreign Minister Shah Mahmood Qureshi on Sunday said that the National Accountability Bureau (NAB) is an autonomous body which takes decisions on its own without any government influence. The foreign minister said this while responding to a question in Multan about the verbal spat between the accountability watchdog and Information Minister Fawad Chaudhry. Earlier on Saturday, Chaudhry and NAB had traded barbs once again after the former ordered an inquiry into the minister’s tweet regarding PTI leader Aleem Khan’s case. Qureshi said: "It [NAB] doesn't work under the government, we cannot influence it. We can't bring it under pressure [and] neither will it take decisions at our behest. NAB has to take decisions and it is autonomous. Our expectation is for NAB to support us in the process to eradicate corruption. The eradication of corruption is a pillar of Pakistan Tehreek-i-Insaf's agenda." "We want corrupt elements, no matter which party they belong to, to be uprooted and the class which had caused losses to the national exchequer to be held accountable. "The nation expects NAB to keep moving forward, without any pressure or concession [to corrupt elements], for a corruption-free Pakistan," he added. Talking about the current economic situation, Qureshi appeared to justify the faltering economy. "At the end of the last government's tenure, the trade deficit was at a historical low, the foreign direct investment (FDI) was extremely low and [foreign and domestic] loans had been increased by several folds." "[Prime Minister Imran] Khan has already said that the previous governments from 1948 to 2008 had heaped a load of Rs6,000 billion, and during the last 10 years, the country was placed under a burden of Rs30,000 billion [debt]." "Who is responsible for the increase in debt by Rs24,000 billion? The 8-month-old government of the PTI could not be held responsible for this," he added. The minister further claimed: "Ishaq Dar under his policy had artificially packed the dollar and to provide sustainability to the rupee, he used to inject dollars into the market." "When the PTI took charge, the foreign exchange reserves were sufficient only for two weeks. The PTI had to face this deteriorated situation and now the party is trying to put the things in order. Finance Minister Asad Umar or anyone else cannot resolve all the issues overnight or in the blink of an eye. "They are gradually taking measures which will start bringing stability in the economy. After a time lag, you will see that exports are increased, a trend of investments will become visible and the same will play a role in reducing unemployment. It is a challenge we have inherited from the previous government. It is our responsibility to overcome the challenge and with the help of God we will overcome the challenge." The minister in his chat with reporters announced that Prime Minister Khan will visit Iran and China later this month. He stressed the need for maintaining peaceful relations with Tehran and reiterated that Pakistan does not interfere in the international affairs of India and Afghanistan, where he said Islamabad has been supporting the peace process. Qureshi said that Islamabad will welcome "any engagement for peace" from the new government to be formed in New Delhi. 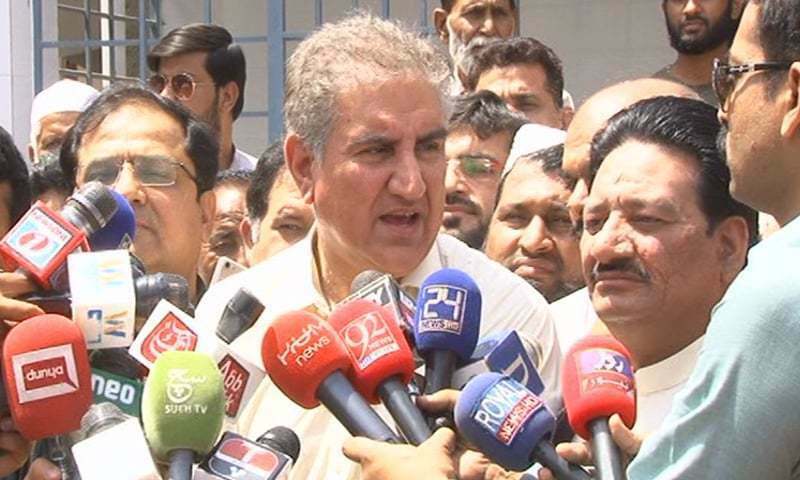 But Pakistan will maintain a high level of preparedness till May 19, when elections in India are due to culminate, he added.Foreign Minister Shah Mehmood Qureshi has said that the steps taken by the Pakistan Tehreek-e-Insaf government will improve the overall economic situation of the country. Qureshi also said that elections have begun in India, adding that Pakistan needs to stay alert till May 19 in the wake of the Indian elections. Next session of Taliban is expected to take place in Doha.